The new MULE SX 4x4 rides on 24 inch tyres and offers selectable 2WD and 4WD with Hi-Lo dual-range transfer case and rear differential lock. Kawasaki PRO styling is underpinned by new suspension settings, reconfigured dashboard plus tilting steering wheel. The dependable OHV 410cc engine, 181kg load and 500kg towing capacity make this is a true Go-Anywhere vehicle. Fully able to tackle the hardest gradients and tasks while unerringly eager to please, the 4WD MULE SX delivers hard-work around the clock and across the seasons. Simple selection of high and low ranges – as well as two or four wheel drive – is matched to a dual mode front limited slip differential and durable, high quality suspension for ultimate control. A durable and very capable vehicle. The bed features a diamond-pate design and textured, scratch-resistant black surface to help keep things in place. A two-level release system is found on the tailgate for easy opening and closing. The bed also tilts, providing access to the engine. 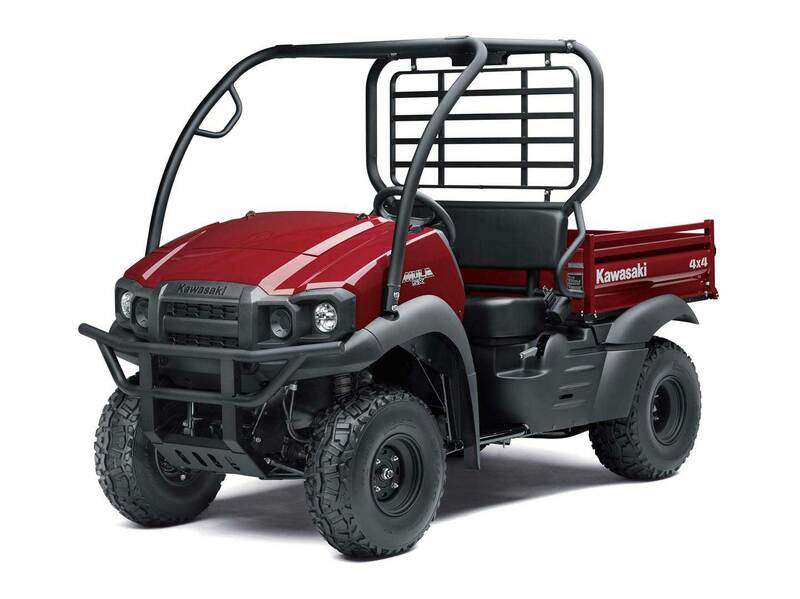 Mule SX models are built around a ladder-type tubular steel frame. Rack-and-pinion is standard on all models and electronic power steering is not available. Independent MacPherson strut front suspension doles out a conservative 3.1 inches of travel, as does the swingarm rear suspension. Ground clearance is 6.7 inches on the SX four-wheel drive models. Models with four-wheel drive feature a dash-mounted switch on the right of the steering wheel to move between two-wheel drive and four-wheel drive. Kawasaki increased the preload on the front suspension for a flatter front-rear balance. Softer rear settings are designed to increase ride comfort. We supply a range of cab options to suit your needs. Please call us to discuss the option to suit your requirements. We assume by using the site you agree to our cookies. However you can opt in or opt out.